Not only will a home with great curb appeal impress neighbors and visitors alike, but a well kept house will also increase the value of your home. If you haven’t had it done in a while, the outdoor surfaces could benefit from some serious deep cleaning. One thing that many people forget is maintain their siding. For our siding cleaning service, we employ a 3-step process that is both gentle and effective for any type of surface, from painted wood, painted brick, vinyl, stucco, and Hardie. 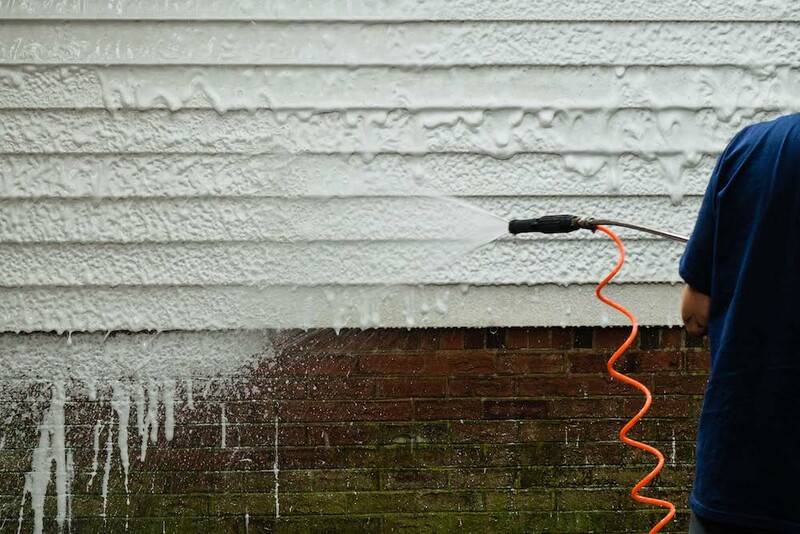 The first step in our siding cleaning process is the application of a gentle foam. The foam solution we use is full-coverage, which means it will remove all the dirt and debris from your siding. We created our foam formula to be strong enough to cling to mildew, mold, and dirt but gentle enough to preserve the surface and surrounding landscape. Rather than blast the foam and dirt away with a high power water stream, we give the surface a gentle rinse. Since our foam gets the deep down dirt, we can use a lower pressure stream to rinse it away. That way, you won’t have to worry about the pressure from the blast of water inflicting damage to the surface or plants around it. Once the surface is clean, we have a final step that sets us apart from other companies. After pressure washing, Renew Crew of Little Rock will seal the surface to ensure that it remains clean and looking like new for longer. Not only will our sealant protect against mold, dirt, and mildew, but it will also protect the surface against damaging UV rays and weather. The products we use are not only non-abrasive, but they are also eco-friendly. In fact, the Renew Crew is fully committed to preserving the environment. If you’re interested in our siding cleaning service, you can contact the Renew Crew at 501-982-9663 or fill out the contact form on our website so that we can give you a free consultation.